THE ANNOUNCEMENT of legislation to see Ireland permit abortion, albeit in restricted circumstances where the life of the mother is at risk, will see an unparalleled level of scrutiny on the workings of the Oireachtas. The divisive nature of the Bill – which many will see as going too far, and others as not far enough – will probably mean a broader cohort of the general public could take an interest in the passage of the legislation and on who might support or oppose it. With that in mind, we thought it may be useful to revise the general procedures on how a mere proposal becomes the law of the land – and the various stages and scrutiny that legislation tends to go through. Generally speaking – though technically it doesn’t have to be the case – a Bill needs to be approved by all three organs of the Oireachtas before it can become law. Those three organs are the Dáil, the Seanad (or ‘Senate’) and the President. A Bill is the name given to legislation before it’s been passed and turned into a law (at that point it becomes an Act). For example, a draft version of a law to bring in new motoring offences will be called the Road Traffic Bill, until it’s passed, when it becomes the Road Traffic Act. Usually a Bill will start out in the Dáil, and only be sent to the Seanad once the Dáil has completely finished with it – though sometimes, particularly at busy times of the year when the government needs to get through a larger quantity of legislation, the Bill can start out in the Seanad first. Either way, a Bill is never discussed by both houses at the same time: a Bill can only be introduced to one house at a time, and will only ever make it to the other house once it’s passed. What’s more, the President doesn’t have the power to introduce his own proposals and then get the Dáil or Seanad to vote on them – a Bill can only be initiated from the Dáil or Seanad (which are known as the ‘Houses of the Oireachtas’). So – how does it all start? This whole process is best explained with an example, so let’s pretend that we’re going to introduce a new Eight Day Week Bill – legislation which proposes to create an eighth day of the week, called ‘Funday’, which will be considered part of the weekend. Let’s also pretend that we’re going to introduce it in the Dáil first, meaning it might only be discussed in the Seanad if the Dáil passes it first. There are five phases involved in having legislation cleared by either of the Houses. That leave be granted to introduce a Bill entitled an Act to extend the week to include an eighth day, called ‘Funday’, which will be considered part of the weekend. This ordinarily meets with no opposition – even if you’re in opposition and the Government expects to vote against it – because it’s considered bad form to at least stop something from being discussed at all. Therefore everyone nods and smiles, and the Bill passes First Stage. In fact, the whole thing is so ceremonial that Bills being proposed by Government ministers don’t even have to bother: they can skip straight through it. It’s Second Stage where the real discussion takes place. Second Stage is the general debate on the Bill, where TDs of all sides are able to contribute and generally discuss whether the idea is a good or a bad thing. When everyone has had their say – or, more usually, when the time allotted for the debate has run out – it’s only then that the Bill will be voted on for the first time. There’s some sad news at this stage: in the vast majority of cases, your Bill is going to be voted down at this stage (particularly if you’re not a member of a government party). For example, the government may decide that your Bill is a wasteful folly – if a year is only 365 days, and a week now has 8 days, there are only 45 working weeks in the year – which means the average Irish worker will be less productive, meaning overall damage to our economy. However, if the government reckons that maybe your ideas are worth taking further, they’ll vote in favour of it – bringing you to the third stage. You might think that the next phase would be called Third Stage – and you’d be forgiven for guessing that. However, third stage is actually called Committee Stage – and it’s here that the dreaded Oireachtas Committees kick in. When the Dáil proceeds a Bill to committee stage, it (usually) delegates responsibility for considering it to the Oireachtas Committee responsible for that particular area. In this case, it might be the Oireachtas committee on Justice, Equality and Defence. There are some cases, however, where a Bill is seen as being so important that it is taken in ‘committee of the whole Dáil’ – that is, the entire Dáil turns itself into one committee and deals with the legislation as a whole instead of sending it into a smaller group. So at some point the Committee will hold meetings to discuss the proposal – and might, at this stage, hold a couple of meetings where it may invite lobby groups or representative bodies (like trade unions or enterprise promotion bodies) to get their take on things. Sometimes this is done before the Bill is actually published, so that their feedback can be included from the get-go. Committee stage, more vitally, is also where amendments can be proposed for the first time. At this stage, the committee will vote on each individual amendment, but also on whether each individual section of the Bill should actually be included. Your draft Bill probably is probably broken down into a couple of sections: Section 1 declaring the name of the bill, Section 2 declaring the insertion of the extra eighth day into the week, Section 3 naming the day as ‘Funday’, Section 4 defining it as being part of the weekend, and so on. Committee stage, therefore, is when genuine and legitimate changes can be made. Let’s pretend that after meeting with trade unions and enterprise groups, the government says it’s happy for the Bill to go forward – but only if the eighth day of the week is a weekday, thereby increasing economic productivity. The government members of the committee (who are always in the majority – that’s why they’re the government and not the opposition) will therefore vote in favour of sections 1, 2 and 3 – but not section 4, meaning it’ll get scrubbed from the Bill. When the Bill as a whole has been dealt with, there’s one final vote on whether to progress it to the fourth phase – and to send it back to the Dáil as a whole. The fourth phase is called Report Stage – and is basically where the Dáil is briefed on any changes that have been made in the meantime. The idea is that the members of the committee ‘report’ back to the government on the amendments they have proposed. This is where any proposed amendments are actually made – the committee (which is only a subset of TDs and Senators, and therefore has less power than the chamber as a whole) only recommends changes, but the report stage actually makes them. Again, this is only a procedural thing – the government will always have a majority in both the committee and in the Dáil, so any amendments approved in the committee will be approved at the Report Stage. Somewhat confusingly, new amendments can also be proposed at report stage – which can often mean delays in the Seanad, where near-identical amendments can be proposed twice in quick succession by the same members at committee and report stages. When Report Stage is finished then there’s only one leg left: the Final Stage. This is another general debate on the legislation – though taking into effect the various changes that have been made to it – and at the end there is one final vote – after which the Bill is passed. Once the Bill has been approved by one House – in this case the Dáil – it then goes to the other House to do the same thing all over again, with only two minor tweaks. Firstly, there is no need for First Stage – the Bill is being ‘introduced’ to one House by the other one, so there is no need for a formal introduction. Secondly, because Senators are also members of the same committees that TDs are, there’s no point sending the same Bill back to the same committee – so in the Seanad, committee stage is always taken in the Seanad by the entire membership. Other than that, the whole procedure is pretty much identical: second stage will be general debate; committee stage will suggest changes and report stage will adopt them; and final stage will reconsider the Bill in the light of any changes that might have been made. On occasion there may be circumstances where the Dáil and Seanad have approved slightly different versions of the Bill – where the Seanad makes changes that the Dáil had not. In these cases, the Bill goes back to the original House so that it can approve the new changes, and so that ultimately both Houses will have approved identical texts. Having been approved by the Dáil and Seanad, there’s only one part of the Oireachtas left to go. Simply, it needs to be signed by the President. 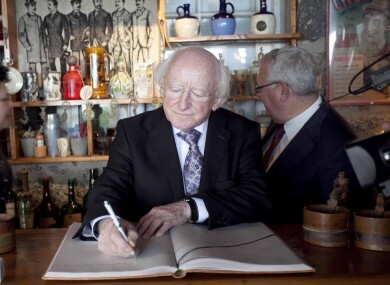 The Constitution doesn’t afford the President an awful lot of latitude in how to act at this stage: he has to sign it between five and seven days after he receives it (unless the Seanad asks him to speed it up), or else convene the Council of State in case he fears it may be in breach of the constitution. The Council of State will talk about the issue and if the President is still not convinced of the legality of the Bill, he can send it to the Supreme Court for an authoritative ruling. This doesn’t happen very often: in fact, only 15 times since 1940. There are a couple of circumstances where the President doesn’t have any latitude. Article 26 of the Constitution, which governs the procedures for this, says it can’t be used for a ‘Money Bill’ – a bill which solely deals with taxes and levies – or for any Bill which itself proposes an amendment to the Constitution. This may seem unusual, but it broadly makes sense: if the constitution defined the week as being seven days long (it doesn’t, in case you’re wondering), and you want to change it to eight days long, you’ll need to amend the constitution. But you’d never be able to do that if the existing Constitution barred you! The process above is a slight simplification of the actual legal routine: there are a couple of powers that the Dáil has and the Seanad doesn’t. These are short but blunt: the Seanad does not have the power to veto any legislation. If it disagrees with legislation, or the Dáil rejects its amendments, it can still plough through with it anyway – but there is a 90-day hold on doing so. The Dáil can therefore ride roughshod over the Seanad if it really wants, but it can’t just bully through it. Again, given that the government probably has a majority in both Houses anyway, this would rarely be the case, and it hasn’t happened in living memory. When dealing with ‘Money Bills’, the powers are even less: the Seanad’s amendments are only recommendations, and not amendments, so the recommendations can simply be discarded by the Dáil in that case. That’s all of it. When the President signs a bill, a copy is bound up and sent to the registrar of the Supreme Court, where it is officially held on file. A version is also placed on the Irish Statute Book, and a notice that the Bill has been signed into law – and become an Act – is published in the Iris Oifigiúil. A list of laws signed by the President is also placed on the President’s website. Email “Explainer: How does a Bill become a law?”. Feedback on “Explainer: How does a Bill become a law?”.